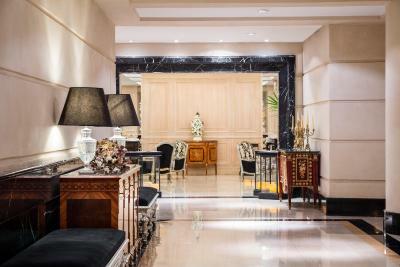 Lock in a great price for Diplomatic Hotel – rated 9.2 by recent guests! Amazing location and breakfast. The concierge was very friendly and helpful. The Diplomatic is a luxury hotel in the grand style yet has maintained a comfortable, intimate feel. The hotel is in a great location, the restaurant is excellent and the staff is friendly and service-oriented. Interesting variety of food for breakfast and a nice touch to have sparkling wine to make mimosas for those of us on vacation. The different stations were spread out so there was no congestion and there was plenty of space for people to sit. Very well done. The staff were very friendly and helpful. This is a beautiful hotel in a great location. We would highly recommend choosing this hotel. We definitely would definitely consider staying here again. The city is beautiful! The breakfast buffet was very nice with a wide variety of foods! Good location, excellent breakfast, good appearance. This a wonderful hotel and we are so pleased that we chose to stay here on two separate occasions while visiting the Mendoza wine region for two weeks. The facility is elegant in appearance, the breakfast buffet in the morning is artfully displayed and is ample and delicious. All of the staff we had the pleasure to deal with were courteous, helpful and friendly. On our second stay Martin Rodriguez the Concierge once again assisted us in order to sort out some of our travel details. We would not hesitate to book this hotel again should we return to Mendoza. We will be certain to recommend the Diplomatic to any friends or family. This hotel very comfortably met our needs having just arrived in Mendoza from Santiago by air. It was centrally located and within easy walking distance to many good restaurants where we enjoyed wonderful meals on both nights of our stay. The hotel is very nicely decorated, our room was large and comfortable and the buffet breakfast was wonderful. Martin, the Concierge was outstanding! Prior to our arrival he arranged for a taxi to meet us at the airport. Martin also very kindly assisted us when we wished to purchase chip cards for our mobile phones and even set them up for us. He also made enquiries on our behalf regarding our car rental and flight reservations. It was a pleasure to have had the opportunity to meet him. He is a huge asset to your hotel. The accommodations, food, and staff were wonderful. Martin, the concierge, made the trip perfect. He is the best!!! 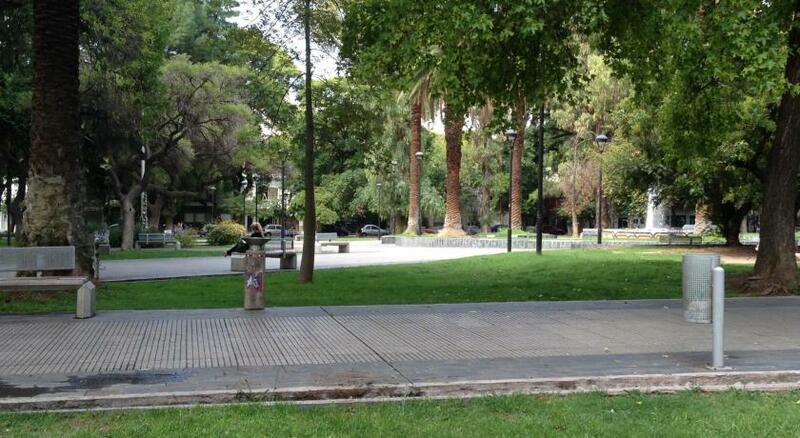 Beautiful hotel, located right by the best restaurants in Mendoza. Our room was very large, quiet and always freshly cleaned. Wifi was very good. Service excellent from all staff. Had massage twice. Breakfast is outstanding. Martin the concierge really made our stay perfect. Arrange for driver from airport and also for a private wine tour. Also helped me with a purchase. Martin was exceptional!! Our driver Sergio, was really terrific as well. 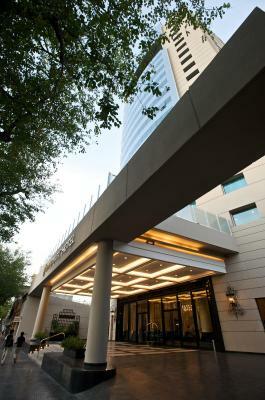 A luxury hotel in downtown, best food, excellent service. Concierge, Martin, is very helpful. Diplomatic Hotel This rating is a reflection of how the property compares to the industry standard when it comes to price, facilities and services available. It's based on a self-evaluation by the property. Use this rating to help choose your stay! One of our top picks in Mendoza.An outdoor swimming pool, gym facilities and a sauna room can be enjoyed in this 5-star hotel in downtown Mendoza. It is surrounded by the best restaurants, wine shops and stores. It is styled with marble floors and offers a gourmet restaurant with Mediterranean dishes. WiFi access is free and a buffet breakfast is included. Rooms at Diplomatic Hotel have luxury French furniture, dark wood floors, white linens and panoramic views of the city or Andes Mountains. The marble bathrooms are stocked with bathroom amenities and a hairdryer. Each room also has a work desk and 32” LCD cable TV. Guests can enjoy Pilates and massage sessions at the health club. This property is also rated for the best value in Mendoza! Guests are getting more for their money when compared to other properties in this city. When would you like to stay at Diplomatic Hotel? This room features a double bed, a private bathroom and views of the city. 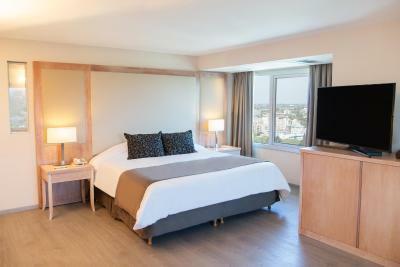 This room features a double bed, a private bathroom, and panoramic views of the Andes mountain range. 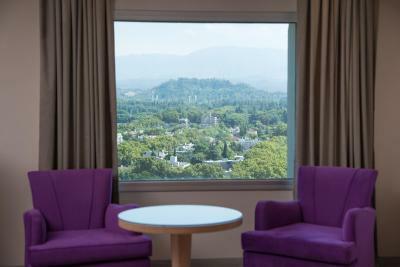 This spacious room offers picturesque views of Mendoza. This room features a king size double bed, large led TV, and a Nespresso coffee machine. This quadruple room features a mini-bar and air conditioning. A daily buffet breakfast is provided. House Rules Diplomatic Hotel takes special requests – add in the next step! Diplomatic Hotel accepts these cards and reserves the right to temporarily hold an amount prior to arrival. For groups of 5 rooms or more, special conditions may apply. Pool water was cold (normally heated but issue with heating system. Helpful staff. Comfortable bed. Good facilities. While there was a good breakfast selection, the quality of the savoury foods wasn't what was expected from a luxury hotel. The pastries, however, wonderful. This is an international standard hotel located in the centre of Mendoza. The room we had was nicely furnished and spotlessly clean, with a view of the Andes. The breakfast was of good quality and the service was both prompt and efficient. We ate in the restaurant a couple of times and found the quality and presentation of the dishes to be very high. A special mention must go to the concierge (Fernando) who organised several day trips for us to the Maipu and Lujan de Cuyo wine regions and had some great recommendations for places to eat. I would have liked a kettle in our room. Location was fantastic. Close to the major city cafe & restaurant district. A minor issue because there's so much to do in Mendoza but there were no TV channels in English, not even CNN. The hotel was a bit more opulent than I'm used to which is not really a negative but was just a bit of a surprise. Beautifully decorated in the public spaces. HVAC system broken in our room -- stuffy and hot. Corner room that was under furnished - lots of space but no place to unpack. The staff needs to be more trained, sometimes slow on taking action. But overall it did not affect my stay. The location - near eveything - and the view of the room facing the Andes.